If you’re hard of hearing and don’t always recognize system sounds alerting you to error messages or a device disconnect, you might want to set Windows Vista to replace those system sounds with visual cues. These cues will appear in the form of alert and message boxes. Choose Start→Control Panel→Ease of Access. You can also open the Ease of Access link by right clicking on your desktop and choosing Personalize. 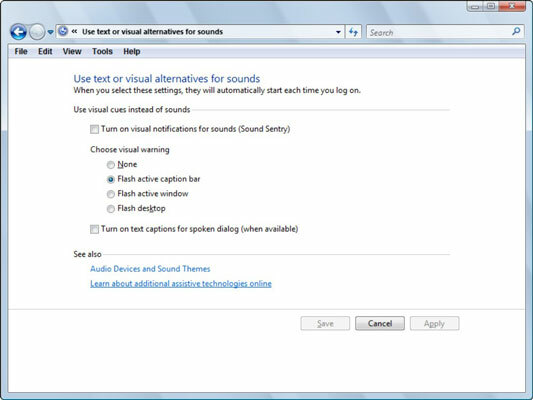 Turn on Visual Notifications for sounds (Sound Sentry): This option tells Windows Vista to play sounds along with a display of visual cues. Chose a setting for visual warnings: This setting lets you indicate what portion of your screen will flash with the visual cues to alert you to an event. Turn on Text Captions for Spoken Dialog (when available): This option displays text captions for any spoken words. Note: This isn’t always available with every application you use. After the setting is turned on, it’s active until you go back to the Sounds dialog box and turn it off. This may seem obvious, but if you’re hard of hearing, you may want to simply increase the volume for your speakers. You can do this by using the volume adjustment in a program such as Windows Media Player, or by modifying your system volume by choosing Hardware and Sound in the Control Panel and then clicking the Adjust System Volume link.